As you may have already noticed, I like to learn from books. I can learn when it is convenient for me, at my own pace, and can refer back to the instructions later. I am particularly grateful to authors who invest their time (and money) to publish books with content which helps us achieve desired results but with simplified and clever methods. 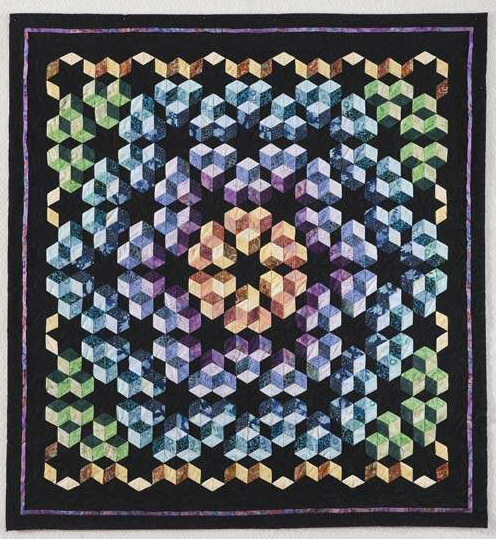 With that in mind, did you know you could make a tumbling block quilt using strip-piecing instead of Y-seams? Had I seen a couple of years ago the book that just landed on my desk, I would have already made a few more quilts with optical illusions. 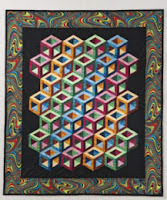 "ABC 3-D, Tumbling Blocks... and More" by Marci Baker is the book I am referring to. 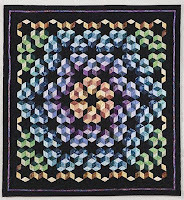 In this book Marci combines her strip-piecing technique with Sara Nephew's designs and expertise with tumbling blocks. What a combination! Should you start with Your Radiant Beauty on page 92? Or should you try Hollow Cube on page 44?